North American area code 928 is a telephone area code in the state of Arizona that was created in a split from area code 520 on June 23, 2001, due mainly to population gains in Tucson, Yuma and Flagstaff. 928 covers northern, eastern, and western portions of Arizona. The area code encompasses areas such as Beaver Dam, the Grand Canyon, Flagstaff, Holbrook, Lake Havasu City, Littlefield, Kingman, Prescott, Wickenburg, Winslow and Yuma, also serving the majority of Greenlee County. The Arizona portion of the Navajo Nation is served by the 928 area code. 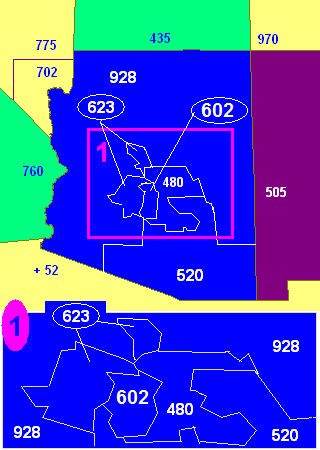 Some areas on the western and northern fringes of the Phoenix metropolitan area such as Lake Pleasant Regional Park in Peoria also fall within this area code. ^ Mattern, H. (2001-02-22). "928: STATE ADDING A NEW AREA CODE". Arizona Republic. Retrieved 2017-09-27.